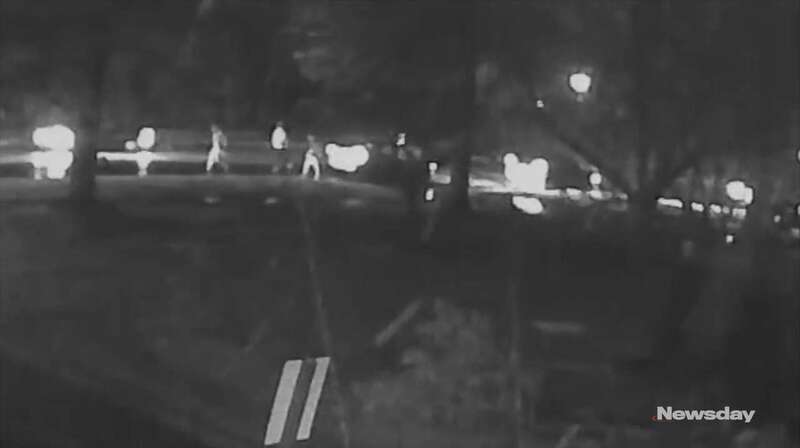 In an effort to find the suspects in a fatal hit-and-run in Central Islip, Suffolk police and Crime Stoppers released a grainy video that shows several people carrying the victim and then ultimately leaving him. Police Tuesday offered a cash reward of up to $5,000 for information that leads to an arrest in the death of Taekwon Campbell, 22, a homeless man who was killed Jan. 1 when two vehicles struck him at about 1:30 a.m. on Lowell Avenue, north of Cypress Street, police have said. The surveillance video shows a man walking alone on the rainy night and the glare of headlights on his back. Then it shows him on the ground as two vehicles pull over. Four people dash out of the cars and they appear to carry Campbell a few yards. Then Campbell either slips from their grasp or they drop him back on the ground, the video shows. Several other vehicles can be seen driving past the scene. Police have said that the first vehicle to strike Campbell was a black or dark-colored SUV with gray lower-body side molding or paint with front-end damage. The second was a gray or light-colored four-door sedan with two or three occupants with possible damage to the undercarriage, police said. Police ask anyone with information to contact Crime Stoppers at 800-220-TIPS, text "SCPD" and the message to “CRIMES” (274637), or submit an email on tipsubmit.com. Callers may be anonymous.